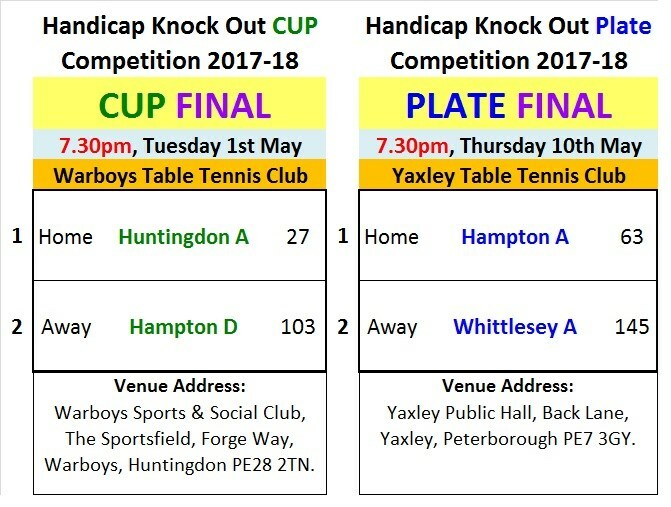 Here are the Handicap Team Points for the Finals of the Handicap Knock Out Cup and Plate Competition 2017-18, which are due to take place over the next couple of weeks. I must remind you that it is the responsibility of the Home Team (Huntingdon A and Hampton A) to provide the Blank Scorecard, a brand new (never used) 40mm Plastic ball even though you will not be playing your Match at Home. All are welcome to come along to the host venues and support the Teams. I would hope that as many Club Secretaries, Team Captains and Teams Members will come along and support them. Venue: - Warboys Table Tennis Club. Venue Address: - Warboys Sports & Social Club, The Sportsfield, Forge Way, Warboys, Huntingdon PE28 2TN. Date: - Tuesday 1st May. Venue Address: - Yaxley Public Hall, Back Lane, Yaxley, Peterborough PE7 3GY. Date: - Thursday 10th May.